Understanding the various types of forklifts and lift trucks can help you make a better decision about what type of new or used forklift is the best for your needs. Forklifts in general are defined as "Powered Industrial Lifts." Colloquially, all industrial lifts are called forklifts, though "lift truck" is probably a more accurate name, since some types of industrial lifts do not use the two parallel forks most commonly associated with forklifts. Alternative lift trucks either have platforms instead of forks or are tractor style trucks designed for moving attached carrying devices. This guide uses the terms "forklift" and "lift truck" interchangeably. In most cases, forklift and lift truck wheels or tires will be either pneumatic or cushion. A pneumatic tire can be either a typical air-filled tire or a solid rubber tire that looks like a standard air-filled tire. A cushion tire (or wheel) is also sometimes referred to as a "press on" tire and basically serves to provide cushioning between a solid wheel and the floor. Traditionally, cushion tires have been made from rubber, but polyurethane tires are becoming increasingly popular. Cushion tire lift trucks are designed for indoor use, while pneumatic tired lift trucks can be operated indoors or outdoors. 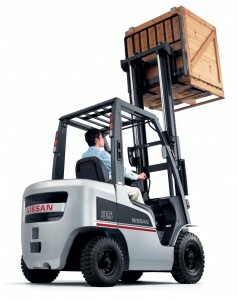 Forklifts and lift trucks are either electric powered or powered by an internal combustion engine. Quick Charge: Fast or Quick Charge batteries can be "topped up" during lunch breaks, between shifts or whenever the opportunity arises. This eliminates the need to change batteries between shifts. DC to AC Batteries: These batteries convert DC power to AC power. 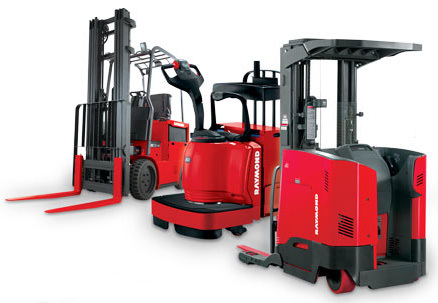 The result is improved efficiency, longer life and faster forklift acceleration. Regenerative Braking: The energy produced when braking is utilized to recharge the battery. Because forklift operators frequently use their brakes, this technology is ideal for lift trucks. Internal combustion engines use a variety of fuels, including diesel, gasoline, LPG (Liquid Petroleum Gas) and compressed natural gas. Both electric and internal combustion powered forklifts are used indoors, though there are combustion and emissions safety hazards to be taken into account when operating fueled vehicles indoors. Gasoline and diesel are for outdoor use only and are the preferred fuels for use on rough terrain and other heavy duty lift trucks. LPG can safely be used indoors if they is sufficient ventilation. Some lift trucks are counterbalanced in order to prevent them from tipping over when carrying a load. This means that the truck body is heavily weighted to equal the lifting capacity of the forks. Others have outrigger extensions beneath the forks or platforms to balance the load and prevent tipping. 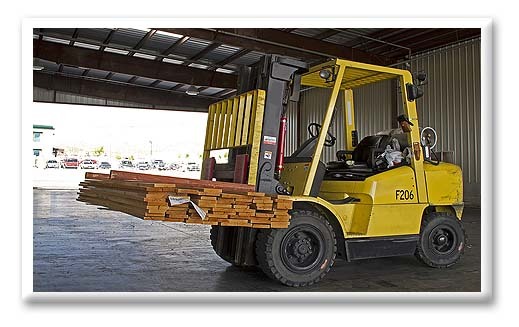 Counterbalanced forklifts are ideal in all situations where outrigger extensions would impede or prevent the fork or platform's ability to access materials. Forklift masts can be either fixed or have extendable (telescoping) vertical reach. Dual (or Duplex) masts have a single immovable mast plus one extendable section that lifts the forks and their carriage. Triple (or Triplex) and Quad masts have two and three extendable sections respectively. Having more extensions allows the forklift to have a lower overall height when the mast extensions are lowered and higher extended reach. Dual mast forklifts are the most common, while triple and quad masts are ideal for low vertical clearance situations, such as doorways. There are three basic aisle types of forklifts: Wide Aisle (WA), Narrow Aisle (NA) and Very Narrow Aisle (VNA). Wide aisle forklifts (standard forklifts) require 11 feet or more of aisle space in order to maneuver. Narrow Aisle lift trucks can maneuver in 8-10 foot aisles. VNA trucks must be able to negotiate aisles 6 feet or less in width. These are specialty vehicles and include turret, swing mast and order selectors (or order pickers). Standard: When the average person thinks of a forklift, they think of a Standard Lift Truck. 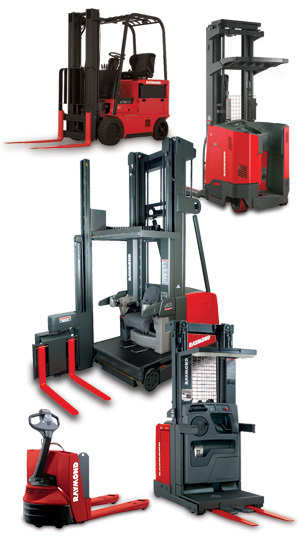 This is a counterbalanced forklift and is only suitable for wide aisle applications. It may be electric powered or have an internal combustion engine and have either cushion or pneumatic tires. The most commonly used standard forklifts have a lifting capacity of 3000-4000 lbs. Motorized Pallet Truck: This is a walk behind ("walkie") or stand-on platform ("rider") forklift. It functions very much like a standard pallet jack, but is suitable for heavier duty work. Motorized pallet trucks are ideal in larger warehouses and factories where pallets need to be moved frequently at near ground level over relatively long distances. Reach Truck: Reach trucks are NA (Narrow Aisle) vehicles. They are variously called Stand-Up, Straddle or Double-deep reach trucks. Reach trucks are designed specifically for pallets stored in pallet racks. They are outrigger trucks with telescoping masts and a horizontally extendable/retractable scissor mechanism to "reach" out to a pallet and then retract, enabling the truck to maneuver in narrow aisles. The vertical reach of these trucks can be as high as 40 feet. Reach trucks are ideal for maximizing warehouse space. Order Picker: Also called an Order Selector, these lift trucks are generally designed to lift and carry personnel, who pick individual items from racks. Order pickers are VNA (Very Narrow Aisle) trucks and can have lift heights of up to 40 feet, though 20 and 30 foot reach models are most commonly used. VNA Trucks: In addition to order pickers, there are two other types of Very Narrow Aisle lift trucks. Swing mast trucks have masts that can rotate 90 degrees to the left or right, thus eliminating the need for the truck body to turn. Turret trucks look similar to order pickers, but the mast and carriage are mounted on a separate "turret" which can swing 90 degrees in either direction. VNA trucks can be very expensive and often require additional guidance systems. They are generally used in very large warehouses. There are seven classes of forklifts. These classes are further defined by their "Lift Codes." Some of the typical distinguishing characteristics of each class and code are the types of tires on the vehicle, the type of engine that drives it and whether it is a counterbalanced or outrigger type of lift truck. The various codes make further distinctions. Class III lift trucks are either walk behinds (walkies) or have a platform for the operator to stand on. Class IV lift trucks may use any of the various fuels associated with internal combustion motors. These are all typical counterbalanced, front loading "forklifts" with cushion tires. The only difference between these and Class IV lift trucks is that these have pneumatic tires. Tractors have draw bars instead of forks (draw bar pull exceeds 999 lbs). Rough terrain forklifts typically have large tractor type pneumatic tires designed for riding across uneven, rough and sloping terrain. They are not, however, "all terrain" vehicles. These are a separate class of forklift and do not match any of the general lift truck codes. Types of rough terrain forklift trucks include those with a vertical mast similar to a high lift forklift, telescoping boom lifts and transportable forklifts designed for loading and offloading materials at a job site. Thanks to our large and comprehensive range of reconditioned and used forklifts, you don't have to pay full retail price for a quality lift truck that can handle any job you throw at it. We carry a full complement of Class I through Class V reconditioned forklifts in our catalog. We also offer Class VII rough terrain forklift trucks in our "Miscellaneous Equipment" range of reconditioned lift trucks and other equipment.